Erica Bunker | DIY Style! 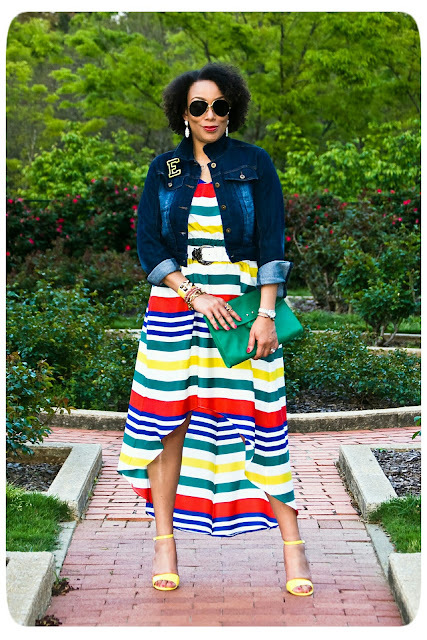 The Art of Cultivating a Stylish Wardrobe: Review: Vogue 8870 | Bold Stripes! First sundress of the season! I'm so ready for warm weather. That is until it's over 100 degrees and humid. Then I'll be begging for fall! Which comes first, the fabric or the pattern? That seems to be a common question for those of us that sew. For this particular project, the fabric came first for me. I was on a quick jaunt to Hancock to partake in a pattern a sale. As per usual, I was weaving my way through the aisles perusing the fabrics as I made my way to the pattern cabinets in the back. And lo and behold! My eyes landed on the most perfect bright, sunny, multi-colored nautical stripe print fabric! Does it not scream SPRING?! My next challenge was to find a pattern that would highlight the fabric and allow it to shine as the star. I picked Vogue 8870. 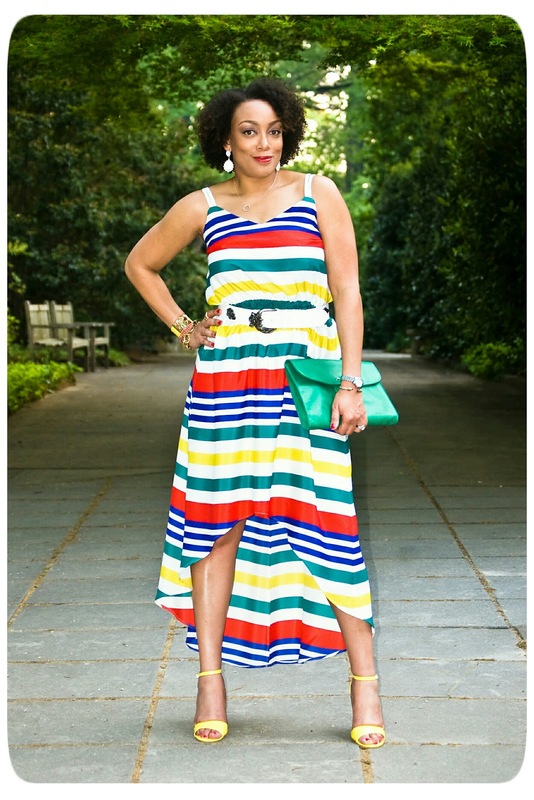 I loved the fact that it's a sundress and has a high-low hemline. The description is: pullover dress has loose-fitting, blouson bodice variations, elasticized (seamed) waist, side pockets and narrow hem. **Wrong side shows on back hemline. ** A: mock wrap, front pleated bodice, and two-piece sleeves. Note: no provisions provided for above waist adjustment. B: elasticized upper back. I cut view B. I added an inch to length of the bodice and three inches to the length of the skirt. I omitted the pockets. I lined the bodice instead of using facings. I left the skirt unlined (I decided to just wear a slip), and I used French seams since the wrong side is showing. And I used a narrow hem. And since the stripes ran vertical, I cut the fabric on the cross grain. This is a very easy pattern that sews up quickly (unless you're using French seams and matching stripes). This is a great pattern that I highly recommend, because even it you don't want to show as much skin with the straps, you can use the version with the sleeves. And you can use the shorter length. I'd like to make the other version as well, but I doubt if I'll get to it. My spring/summer sewing list is LONG and still growing! The bold colors are beautiful on you, nicely done. 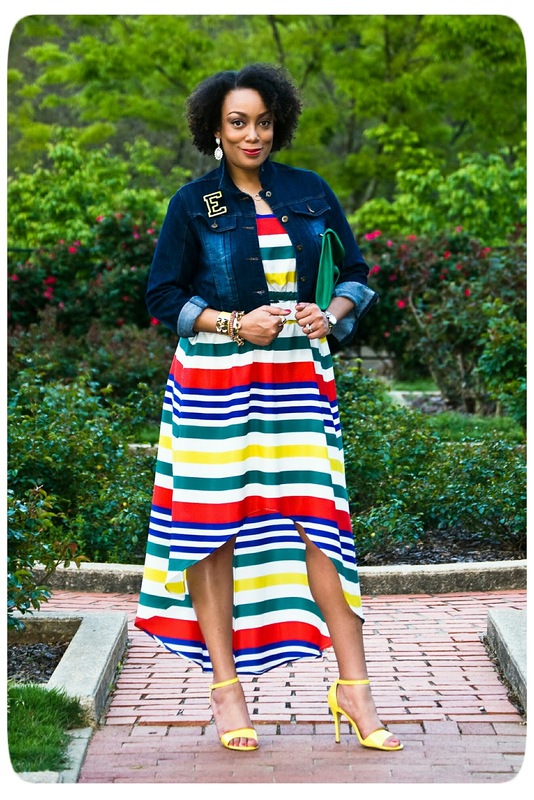 I love the stripes and that hemline. wow! Your dress is very cute and looks great with your styling! Gorgeous. Mom made a dress with that fabric. I'll have to send you a picture of it when I go back over there. That fabric was fabulous at first sight! I'd love to see her dress. Thanks! I LOVE it!!! Oh my goodness, you look DIVINE!! Lovely dress and great pattern. You couldn't have picked a better pattern to show off those stripes! Thanks Divamazon. Don't worry, NYC will be hot and humid before you know it! I've touched this fabric each time I've been in Hancock! Beautiful dress! I can't imagine snow in April! Thanks Mrs. Smith! Your fabric is soooooooooo mcuh better than what vogue pattern used! You just sold this pattern to me. They ought to pay you a comission for all the patterns you sell for them. Wouldn't that be great?! LOL Thanks Grace! and we did it again, LOL we made the same thing, i made mine this past weekend and am wearing it tomorrow. You look great and I love the fabric!!! Love it . . . Do you mind if I post it on my Sassy Sewing Bee facebook page? Only just created it for anyone to post but I like to post anything I see too lol. Sassy, not at all. Thanks! Oh fab. I'll share your facebook post on it then, as I follow your new page. 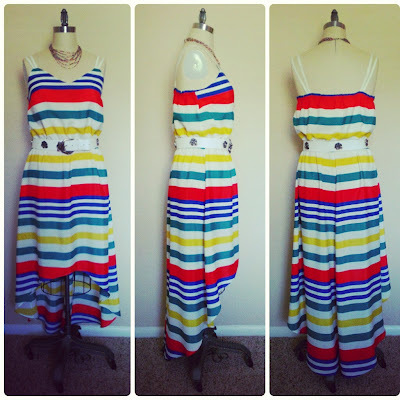 Another great sew from you! Now I've watched The Great British Sewing Bee I'm ready to start doing some more construction! They have v high standards and demanding matching stripes/ patterns etc!! It is beautiful! Unexpected fabric choice, don't think I'd thought of it for that dress, but of course I love it now that I've seen yours. This is a little bit fabulous! I always find something I like! Thanks Levone! Super pretty!! You always find the best fabric! And match it with the perfect pattern! 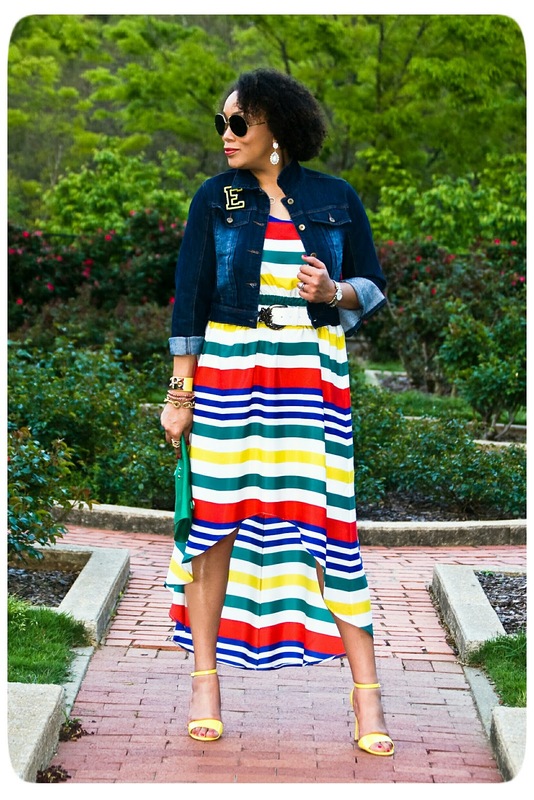 This is such a fun, colorful summer dress. You look great! This look is so fun and flirty. You look fantastic. Thanks Dr. Reginia! I know I'm going to enjoy wearing it! I have this pattern! This is the same dress Mimi G just posted a couple days ago! It's nice to see it in completely different fabrics! I'll have to make this once I find the right fabric :). It's super pretty! 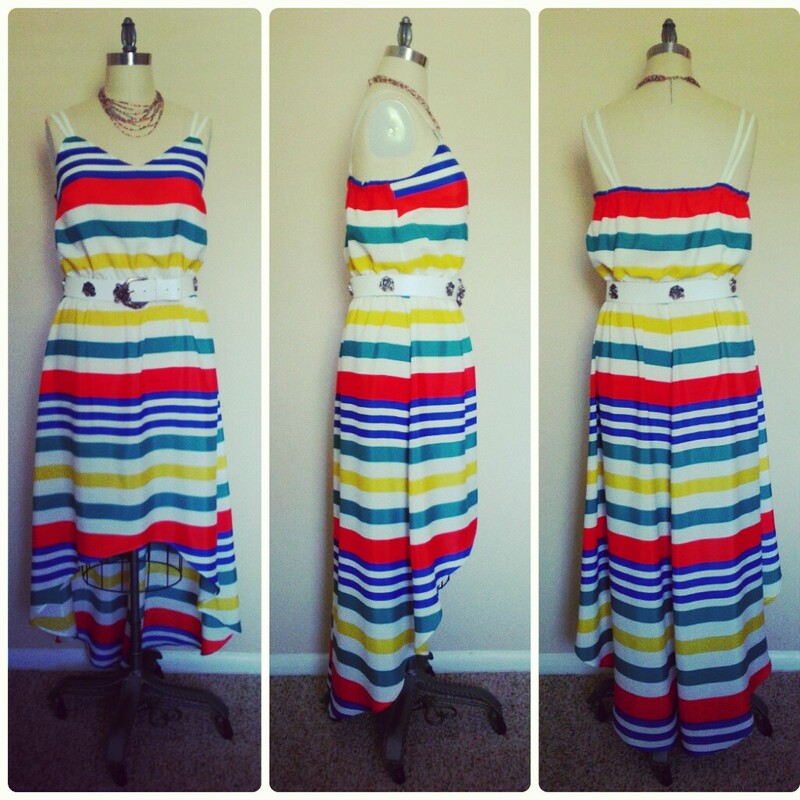 Miesha, the fabric possibilities for this dress are endless! Thanks! ha! I just bought this same fabric to make a dress a few days ago. great minds think alike! and i love the hem on yours. so cute. Cute dress Erica. I usually like your style anyway. I agree with you on the fabric for me often comes first then I decide what pattern will bring it out. I think I will be making this pattern too. LOVE this!!! It looks great and really on point.